Today Chad and I took Andrew to see his eye surgeon. After examining his eyes again, we all decided that he needs to have another surgery. When Andrew was only one year old, Chad noticed that his left eye moved very high and outward he began seeing a specialist. “Doing the eye”, has become one of Andrew’s famous tricks. Especially when he’s in trouble. 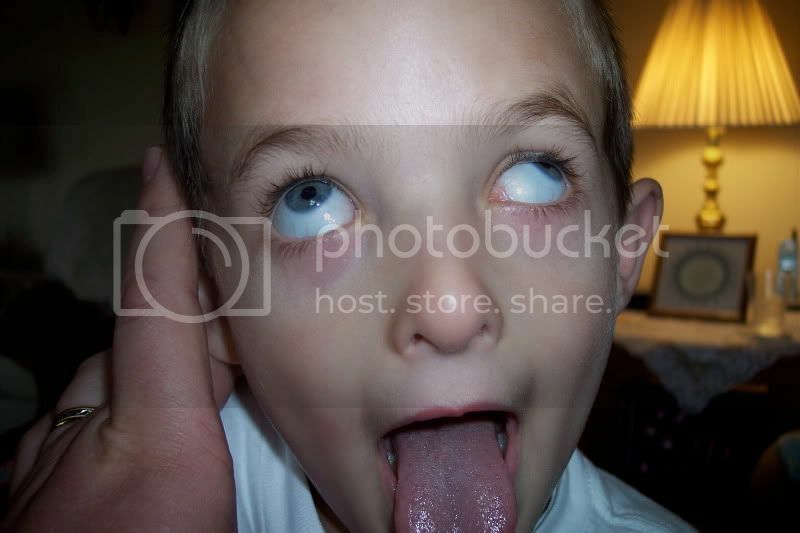 Try discipline with a straight face while your kid makes this face…impossible! We end up laughing every time. Back in June, while visiting family in Birmingham, we took Andrew to see an eye specialist at the Children’s Hospital. Having a second opinion confirmed to us to go ahead and try to have Andrew’s eye fixed…again. Its not an easy decision to have your children undergo more surgery. We would like to have it done before preschool begins but the surgeon is booked all the way through October. Andrew has been added to the top of the cancellation list to try and fit him in. If he can’t get in before school then we’ll wait until the first of the year. For whatever reason, God seems to continue to lead us down this road of surgery. Thankfully, Andrew has no fear…ignorance is bliss! After his first surgery in Feb 2009 he cried for Emily and a ham sandwich. The next time he goes into the recovery room, I’ll have the sandwich ready…no Emi though! Check back for more updates. Your prayers mean so much to us.